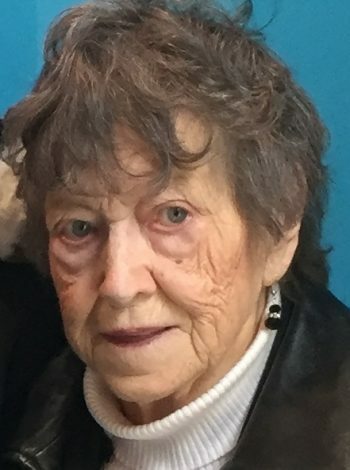 Effie Sullivan passed away peacefully on May 3. Surrounded by her loving children: Lorna Montgomery (George), Ross (Cindy), Dean (Audrey), Gail (Wayne) and Lisa (David); grandchildren: LeeAnn, Renee, Jennifer, Heather, Laura, Nicole, John, Ann, Sam, Harry, James, and Sam Hoddinott (Audrey) and great grandchild Finley. Special thanks to Dr. Murphy and Dr. Miller and nurses of 5NB Gynecology Unit and the Palliative Care Team. Cremation has taken place entrusted to Carnell’s Funeral Home. There will be no visiting. Following a private family service, a celebration of life will take place at 3:00 p.m. on Monday May 7 at St. Thomas’ Church Cannon Wood Hall, Military Road. Donations in Effie’s memory may be made to the Kidney Foundation. My deepest condolences to all of you. She was a lovely woman. Deepest sympathy on the passing of your mother. When we lived on Dunfield St our gardens were joined,many fond memories of this time as neighbours. Thinking of you all at this time. So glad you have such wonderful memories of your mom. Deepest sympathy on the loss of your mother.My prayers are with you. To the Sullivan Family; Deepest and sincere sympathy as you mourn your Mom’s passing, just finding out this out now. Have wonderful memories of your Mother, right back to when she taught me at Sunday school and over the many years since. A lovely and cheerful woman ! May your happy memories give you much comfort and peace. My most sincere sympathy on the loss of your mother. Some very good memories will remain with me from the years 1965=1967 when I stayed there. Deepest and sincere sympathy as you mourn your Mom’s passing. Our thoughts and prayers are with you and family at this time of loss. Gail and Family, so sorry to hear of your mothers passing. My sincerest condolences to you and your family. The Sullivan Family.We were so sorry to hear about your mothers passing Please accept our sincere sympathy.She will be missed. Very sirry to learn of your mother’s passing. To those of us who worked alongside her within the St. Thomas’ Church community, she left us with many fond memories. Our sincerest condolences to your entire family. Dear Lorna , Gail , Lisa , Ross and Dean . I am so sorry to hear that your mom passed away . I have fond memories of Aunt Effie . She was a wonderful aunt to me when I lived with your family . She was so devoted to her church . She is now an Angel watching down over her loved ones . God speed Aunt Effie and Rest In Peace . I’m so sorry to hear about your mother’s passing. Please know you’re all in my thoughts and prayers, during this sad time. May your treasured memories give you much comfort and peace. My sincere sympathy as you mourn your Mom’s passing. St. Luke’s Bridge won’t be the same without her; she will certainly be missed. You are all in my prayers..I first knew Effie when I was a member st Thomas ‘s church,, many years ago..She was a very special lady..
Jeanette and I offer our sincere 7condolences on the passing of a special lady . For many years Effie made a tremendous contribution to the parish life at St. Thomas’s church. If there wasn’t a project she could work on , our dear Effie created one , and was not shy in recruiting helpers. May God Bless you as we celebrate the life of this wonderful faithful Christian lady. Lorna, Gail, Lisa, Ross and Dean and families. We were so sorry to hear of your Mom’s passing. Our family are thinking about you at this sad time. She is now free from suffering. We will miss her at St. Thomas’. Love to you all BIll Lorna & family..
TO THE SULLIVAN FAMILY………….OUR SINCERE SYMPATHIES ON YOUR MOM’S PASSING. sincere sympathy to Effie’s family.at this sad time. So sorry to hear of Aunt Effie’s passing, Our thoughts & prayers are with you all, at this sad time. God Bless! !